Sail All Included this Summer! Book any suite or stateroom by May 1, 2019 on Celebrity Edge vacations to Europe this summer and the first two guests will receive 4 FREE PERKS! Cruises must depart between 5/15/2019 and 8/10/2019. In addition, the 3rd, 4th, and 5th guests in triple, quad, or family staterooms will get 50% reduced fares. NOTE: Cruise must be booked by May 1, 2019 (the "Offer Period"). 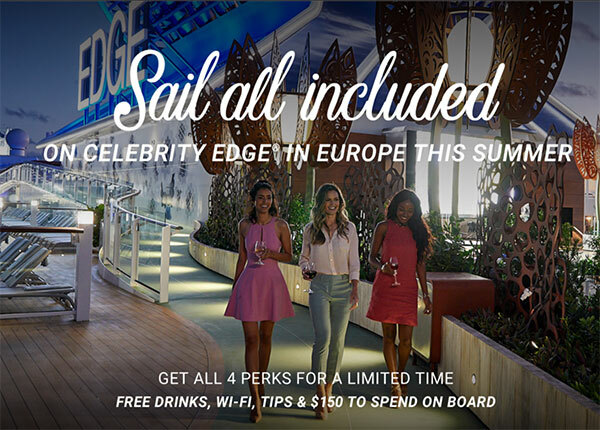 Offer applies to Europe sailings on Celebrity Edge departing 5/15/2019 - 8/10/2019. Celebrity reserves the right to cancel the Offer at any time, correct any errors, inaccuracies or omissions, and change or update fares, fees and surcharges at any time without prior notice. Contact us for complete offer details.